The Christmas season is one of the happiest times of the year. Unfortunately, it also happens to be the time of year that we tend to eat the most unhealthily. Our workout habits start to fall by the wayside because of parties, shopping, and family activities. As a result of less healthy eating and less physical activity, we tend to fall into a weight gain rut that many of us have trouble getting out of. However, there is a ray of hope. Your waistline doesn’t have to expand to the last belt loop. 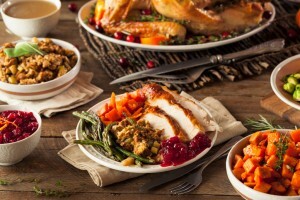 There are healthier alternatives that you can put on your dinner table so you can avoid the trap of holiday weight gain. Even better, these alternatives won’t make you feel like you are being cheated out of good holiday food. The last thing that anyone needs is to eat their limit of fat and calories on appetizers before the meal even starts. Dips are the ultimate holiday fat trap that no one ever thinks about. Save yourself from that trap and choose a yogurt based dip instead of traditional full fat dips. In a bowl, mash beans to break the surface and blend. Add yogurt, tomatoes, arugula, olives, salt and pepper. Mix well. Let the dip stand for 20 minutes before serving. Recipe provided by oikosyogurt.com. Sweet potatoes are slowly taking over the world. In fact, for many people, sweet potatoes are often preferred over traditional potatoes. They taste sweeter and are a much healthier option. Oven roasted sweet potatoes have 50% fewer calories per serving than than traditional candied yams. Preheat oven to 450°F. In large mixing bowl, combine all ingredients and toss. Arrange potato slices in single layer on heavyweight rimmed baking sheet or in 13×9-inch baking dish. Place on top rack of oven and roast until tender and slightly browned, about 40 minutes. Serve warm or at room temperature, garnished with thyme sprigs. Recipe provided by epicurious.com. Most cranberry sauces that you get out of a can are packed with sugar and other artificial sweeteners, so any healthy benefit you may have gotten from a cranberry is completely wasted. Unfortunately, the natural sweet taste of cranberries is too much of a temptation for many to resist. There is a way, however, to get that same great cranberry taste without having to consume all that extra sugar. Grind together the cranberries and apples, using a sweet apple. (May also use blender) Add orange juice, chopped nuts and sweetener to taste. Refrigerate several hours before using. Recipe provided by cooks.com. Think about everything that goes into a normal casserole. Cheese, potatoes, pasta, meat and a wide variety of other unhealthy ingredients. Do you really need additional meat since the highlight dish is usually a turkey or ham? Let’s be honest, the last thing we need on our plates is more fatty cheese. Instead of a casserole, go with fresh green beans. You can prepare them so that no one will even miss the casserole. Place green beans in a steamer over 1 inch of boiling water. Cover, and cook until tender but still firm, about 10 minutes; drain. Meanwhile, melt butter in a skillet over medium heat. Saute almonds until lightly browned. Season with lemon pepper. Stir in green beans, and toss to coat. Recipe provided by allrecipes.com. Wheat flour has so many more health benefits than white flour. The refining process that white flour goes through strips the flour of essential nutrients like fiber, folate and B-vitamins. Have you ever thought about why white bread is white? It’s because the flour contains preservative additives that act as bleaching agents. Do yourself a favor, choose wheat rolls instead of white rolls this Christmas. Dissolve yeast in water and honey for about 5 minutes. Combine honey, olive oil, eggs, and salt in a large mixing bowl. Slowly add flour and knead until it loosens from sides of the bowl. Place in large oiled bowl, cover and let rise until about double. Be sure it is in a warm place. Punch down and remove dough. Shape dough into rolls about 2 inch in diameter. Place on an oiled or nonstick baking sheet, cover and let rise for 30 minutes. Pre-heat oven to 375 degrees. Bake at about 375 degrees for about 20 minutes or until browned. Recipe provided by food.com. There isn’t another dish on your table that can match the amount of carbs and calories that traditional mashed potatoes have. Not only are potatoes an unhealthy option, but the addition of things like butter, cream cheese or ranch flavoring make the consumption of traditional mashed potatoes an all out assault on your heart.Cauliflower is a great way for you to get a similar great taste without putting your body in danger of a carb overload. Place a steamer insert into a saucepan and fill with water to just below the bottom of the steamer. Bring water to a boil. Add cauliflower, cover, and steam until tender, about 10 minutes. Meanwhile, heat olive oil in a small skillet over medium heat; cook and stir garlic until softened, about 2 minutes. Remove from heat. Transfer half the cauliflower to a food processor; cover and blend on high. Add remaining cauliflower florets, one at a time, until vegetables are creamy. Blend in garlic, Parmesan cheese, cream cheese, salt, and black pepper. Recipe provided by allrecipes.com. With simple adjustments to your dinner menu, you can help yourself avoid the trap of holiday weight gain that nearly everyone falls into. That feeling of feeling bloated and exhausted can easily be eliminated this year by paying careful attention to ingredients and making simple healthier substitutes to what you have traditionally prepared in the past.